Steve and Katie had worked at the same company for over two years before they actually met, or even knew that each other existed. On June 11, 2014, they officially met during a work happy hour through some mutual friends. They knew right away that they were meant to be friends. Little did they know, they would be married only three short years later. The life changing day that Steve popped the question happened on October 28th, 2017 in Hermann, Missouri. Hermann had always been held dear to Katie and Steve's hearts and they have had many great times there together, exploring the wineries. With that being said, he knew that would be the perfect place for the proposal. They hit the road early with friends to get a head start on the day to enjoy Hermann's Oktoberfest. A few hours in, they finally got to Oak Glenn Winery, where he was planning on making his big move. The first thing Katie wanted to do when they arrived was take photos in front of the beatuiful field. As their friends were taking pictures (and a secret video) of the two of them, Steve turned to Katie to tell her that this was one of the first places he fell in love with her. After more sweet talk, he bent a knee and asked her to be his for the rest of his life. This was a complete surprise to Katie, and everyone knew except for her. She happily said yes. Katie's parents were waiting patiently for her call with the news. Steve asked them for permission for her hand in marriage just weeks before. Katie had e-mailed our Haue Valley staff back in October saying Haue Valley was where she wanted to have her special day. However, we were booked up. When she asked if we ever had any cancellations, we unfortunately had to tell her our calendar was up to date. Katie then went to search for another venue. In November, she e-mailed Haue Valley again "just to check", but once again, we still had no open dates. In December, she e-mailed us "one last time" just to see if MAYBE we had a cancellation before she signed on the dotted line at another venue. Haue Valley had a cancelation that morning! It was for a Saturday in April. This meant planning a wedding in four months, but Katie and Steve said "Let's do it!" We are so happy it worked out for Katie and Steve. They were able to plan the wedding of their dreams in four short months! The flowers and greenery on this beautiful April day weren't the only things blooming at Haue Valley. The love these two have for each other is so sweet. Every detail of this magical day was truly breath taking. 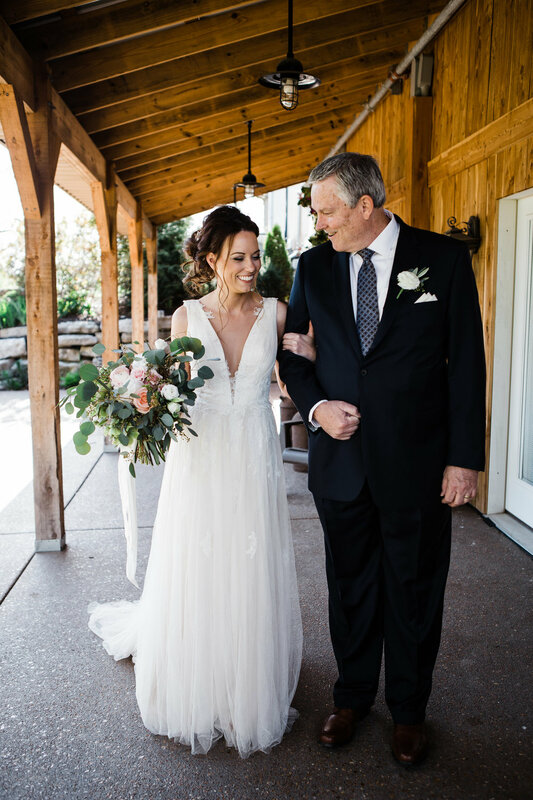 Katie's stunning dress was from The Ultimate Bride. Florals were crafted by Wildflowers. A delicious dinner served by Graze Catering was followed by dessert from Cake Designs by Mary LLC. Entertainment throughout the night was provided by Applause Productions, including a DJ and a photo booth. Special thanks to our friends over at Jess and Jenn Photography for sharing the beautiful photos from Katie and Steve's special day.